On Midsummer’s Eve, three friends gather in a secluded meadow in Sweden. In the beautifully clear twilight, they don costumes and begin a secret role-play. But an uninvited guest soon brings their performance to a gruesome conclusion. His approach is careful; his aim is perfect. Three bullets, three corpses. And his plans have only just begun to take shape. Meanwhile, Inspector Kurt Wallander’s summer vacation has ended and he’s back at the Ystad police station. Constantly fatigued, he soon learns his health is at risk—but all his energies must go into his work when a fellow officer is murdered. In the course of their investigation, the police slowly realize how little they know about what is going on in their seemingly serene town. An unknown killer is on the loose, and their only lead is a photograph of a strange woman no one in Sweden seems to know. Forced to dig more deeply into the personal life of one of his colleagues, Wallander uncovers something he could never have imagined. 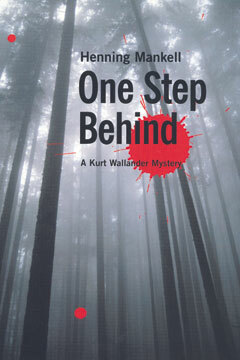 One Step Behind is the eighth book in what the Los Angeles Times Book Review calls the “exquisite” Kurt Wallander series.